Shrimp is one of my favorite foods. One of the things the things that I like most about shrimp, other than their flavour and texture, is that they cook up really quickly. They take no more than a few minutes to cook and that means that many dishes that focus on the shrimp cook in no time as well. In fact, a shrimp dish can be as simple as cooking the shrimp in a tasty sauce for a couple of minutes. 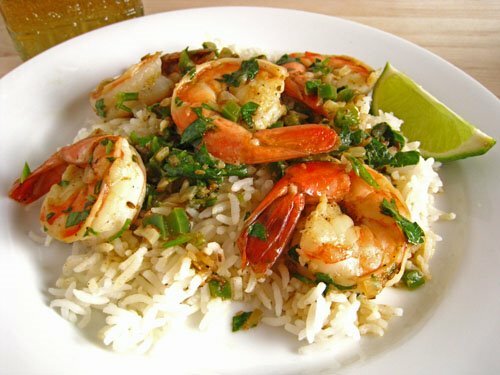 This is one such dish, where the shrimp are cooked in a simple tequila and lime sauce. I wanted to add a bit of freshness to the dish so I used a jalapeño pepper as the source of heat. Fresh cilantro, one of my favorite herbs, was a must. I wanted to serve the shrimp on rice so I made sure that there was a nice amount of the tequila and lime sauce left to soak into the rice. The tequila lime rice came together quickly and was really tasty. Add the garlic, jalapeño and cumin and saute until fragrant, about 1 minute. Add the shrimp, tequila and cook until the shrimp are pink, about 1-3 minutes per side. Simmer the sauce to reduce to the desired amount. Remove from the heat and add the shrimp, lime juice, cilantro and salt and pepper. Take a look at the Weekend Herb Blogging roundup at Paulchen’s Food Blog. you food always looks so fresh and inviting! what kind of lighting do you use for your photos?? thanks for commenting on my Boston Cream Cupcakes! Come and visit any time! Leslie: I am using a Lowel Ego light for my photos. I love shrimp too. These look really good! I bet they were yummy. I need to find out, at least shrimp is one of the few fish I can get here in the back of beyond. Another shrimp dish! Incorporating liquor into cooking is quite a new field for me. Seems exciting! I too love shrimp– one of my favorite foods 🙂 We also have a half-finished bottle of Tequila that is not finding much use, yay! Looks great, Kevin. Shrimp is always high on my list of quick and tasty dinners. Oh yummy! I love tequila0lime shrimp but it’s been so long since I’ve made it. It’s time to revisit that! oh wow Kevin…these look very yummy….I love anything with lime…great photo!!! I notice that ppl who live in the west call it “shrimps” while asians call it “prawns”? But it looks the same anyways. I’m going to try this dish in future, I have shrimp lover too, and it looks so good! Kevin, Looks and sounds terrific! Looks so good Kevin! Very summery and refreshing! I love shrimp too…this looks delicious. Looks like a great summer dish! WOW Kevin that looks soooo good! I love the idea of tequila lime rice. looks and sounds great Kevin! We love shrimp in this household too! This is one good shrimp dish! Lime and tequila with shrimp is genius! Great dish! Shrimp is at the top of my fave foods too and this is one recipe I’ll be making soon. you really never cease to amaze me kevin with your inventiveness!! lime, tequile and shrimp sounds fabulous! I love the quick meals you have been doing lately. Such an awesome and perfect way for summer. Mostly i tend to make in garlic butter or in a cream sauce. Kevin, that’s the business…and so easy…gotta try it. Kevin, looks good. I cook chicken a similar way… I agree with you as well I love shrimp because they cook up fast. Looks delicious! I usually can’t cook with tequila though… I end up having a taste here and there and before you know it, I’ve forgotten why I even had the tequila out in the first place! What a perfect meal for this hot weather! Thanks for the idea! I just read another tequila shrimp recipe yesterday – and this one sounds just as good! This is a real nice recipe. I agree about the shrimp being quick to cook, it is great when you don’t have so much time. I love the ingredients I have never tried tequilla with shrimp before. It looks really tasty. Once again, a marvelous picture that makes me very hungry! This looks great. I have been meaning to try a similar recipe for some time (spicy lime shrimp tapas style). i love the addition of cilantro here for the bright summery taste. Shrimp and tequila–two of my favorite things! they all look delicious, Kevin! This looks really delicious! I love the cumin touch. This sounds like delicious summer food…and a great excuse for a healthy sized swig of tequilla on the side! We tried another recently posted recipe with tequila lime flavoring (it was a chicken breast recipe), and it was totally delicious. I figure your similar treatment on shrimp will be a success as well. It’s on the agenda for next weekend. this looks delicious. i love how quick and easy shrimp dishes are too. wish i had some tequila on hand! Claudia: I normally cook the onions and garlic on medium. I will have to add that to the recipe. Hey Kevin, Great Recipe. I just made it for dinner. I used to work at a restaurant that served a similar dish only they added fresh tomato's as well. So I did as well. Although I did fing the lime a little bit overbearing for my taste (nothing a little honey won't fix next time around), it turned out pretty well. I look forward to trying more of your recipes. They all look so delicious with your fabulous pictures. I just made this today and it came out wonderful! Especially easy when you're only making a quick meal for one.